The Xiaomi Mi Drone comes in 4K (30 fos) and 1080p (60 fps) editions, both with a 3-axis gimbal. 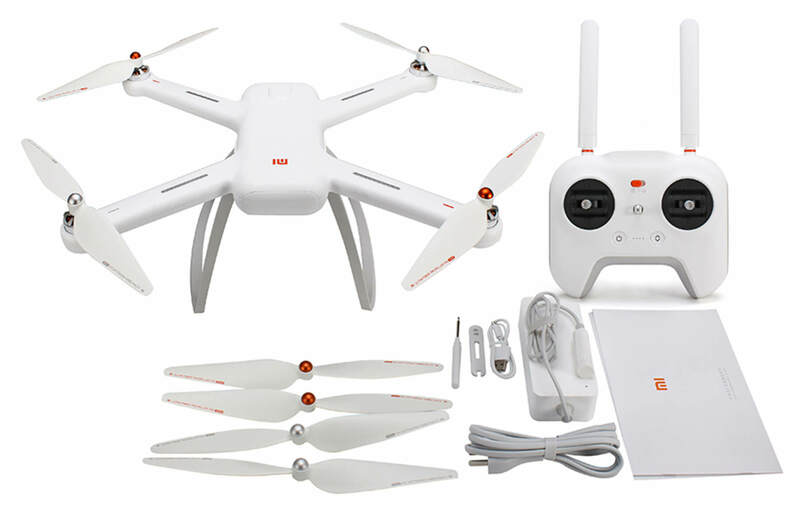 Its built and flight features are reminiscent of the DJI Phantom 3 Standard and it comes in at a much lower price. Although not a folding drone, its landing skids can be folded up, props unscrewed and the camera removed with a slide. This gives you potential to get it in to a bag without having to buy special travel accessories. It packs up to 4K video at 30fps with RAW stills, 720p FPV, GPS flight mapping and a decent 27 minute flight time to top it all off. Its flight controller is very simple and lets the built-in flight features do the hard work. The Xiaomi Mi Drone has a flight range of 100 metres with pre-programmed no-fly zones. Xiaomi are a relatively unknown brand in some countries, they are a Chinese company that also produce the excellent Mi Smartphone. The Xiaomi Mi Drone has made a splash throughout the drone community with lots of praise in numerous written and video reviews surfacing around the Internet. – 2KM FPV at 720P video in the screen. – With Pointing flight feature,the drone can fly to the point you touch. – With Surround feature,can surround the point. – It can also flight the routes you set. – APP control,XIAOMI quadcopter will preview controlled by transmitter or APP.